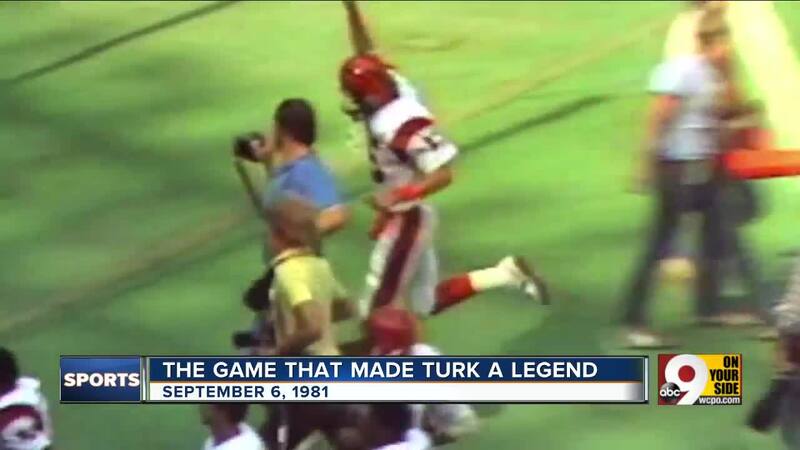 CINCINNATI — For one game - his very first NFL game - Turk Schonert was the toast of the town. The longtime backup quarterback is still remembered for leading an improbable comeback victory in the 1981 season opener that launched the Bengals to Super Bowl XVI. The Torrance, California, native, who died of a heart attack Thursday - two days after his 62nd birthday - was a member of Cincinnati’s two Super Bowl teams following the 1981 and 1988 seasons. He played eight seasons for the Bengals in a nine-year NFL career (1981-1989), backing up Ken Anderson first, then Boomer Esiason. Popular with teammates and fans, he attended the 30th anniversary celebration of the Bengals’ 1988 squad at Paul Brown Stadium last September. "Turk was a great teammate and a great friend," Esiason, the Bengals quarterback in Super Bowl XXIII, tweeted Thursday night. Schonert rose to his single greatest moment – unexpectedly, to be sure - at Riverfront Stadium on Sept. 6, 1981 against the Seattle Seahawks. After Anderson threw two interceptions - including a pick-six - the Bengals fell behind 21-0 in the first quarter. Coach Forrest Gregg put in the newcomer from Stanford to rescue the QB who would become the NFL’s Most Valuable Player that season. Gregg said he wasn't surprised that Schonert saved the day, even after what happened on the first play, even though Schonert hadn't played at all the previous year after being drafted by the Bears in the ninth round. "Cool, calm and collected," Gregg described the 24-year-old Schonert after the game. "The most surprising thing that happened today with Turk Schonert wasn't the fact that he engineered the touchdowns and played such a fine game, the thing that surprised me the most was mishandling that first snap." No, Schonert's debut didn't start promisingly. He fumbled the first snap and the Seahawks recovered. But he said he didn't lose any confidence in himself and his teammates didn't lose any confidence in him. WATCH Schonert, Gregg, Archie Griffin and Pete Johnson talk about the comeback win. "I got in there and just said, 'Hey, we've got to move the football,'" Schonert said. "I tell you what, fumbling the first snap didn't bother anybody. We just said, 'Hey, we're going to move it down and score.'" Helped by a strong rushing attack (210 yards) and a defense that shut out the Seahawks the rest of the way, Schonert led the Bengals to a 27-21 victory, completing 9 of 18 passes for 130 yards and rushing seven times for 41 yards. Pete Johnson ran for two TD’s, Archie Griffin ran for one and Jim Breech kicked two field goals. Then, just as suddenly as it began, Schonert’s stardom was over. Anderson started the rest of the season, and Schonert went quietly back to the sidelines. He threw only one more pass the rest of the year. Meanwhile, the Bengals went on to a 12-4 record, then beat the Bills and Chargers in the playoffs before losing the Super Bowl to the 49ers. Schonert had only seven starts in his Bengals career with a 5-2 record, but he secured his legend in his very first game. He had five starts with the Falcons in 1986 and finished with a career record of 7-5 as a starter. Overall, he had 11 touchdown passes, 20 interceptions and a 61.9 completion percentage. Schonert had a longer, 13-year career as an NFL assistant coach for five teams, starting when former Bengals coach Sam Wyche hired him with the Bucs (1992-95), followed by the Bills (1998-2000), Panthers (2001), Giants (2003), Saints (2005), and Bills again (2006-2008). He was offensive coordinator in his last year in Buffalo. Schonert was head coach of the Sacramento Mountain Lions (United Football League) in 2012-13. Most recently, he was an assistant for the Montreal Alouettes (Canadian Football League) in 2014-15. As a senior quarterback at Stanford, Schonert was NCAA passing champion and set a team record for completion percentage. Perhaps in a sign of things to come, he rallied Stanford from a 21-0 halftime deficit to tie top-ranked USC, 21-21. As a kid, Schonert played in the 1968 Little League World Series as a shortstop and third baseman for Garden Grove, California. Schonert was stricken at South Carolina home. He leaves his wife of 33 years, Beth, along with their four children (Stephen, Jake, Camery and Hayden) and grandchild Caleb. Semi-private services will be held in Seneca, South Carolina, and in Cincinnati. Donations can be directed to the American Heart Association.